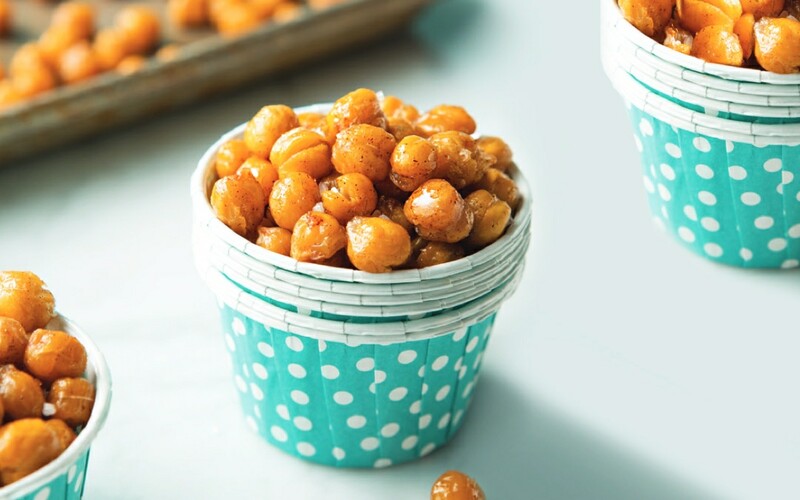 A crunchy treat, these chickpeas (garbanzo beans) are deliciously hard to resist. Chickpeas are naturally full of protein, fiber and antioxidant phytonutrients, so they make snacking downright healthy. For more recipes and fun tips for a Calmful Back to School, download our latest free eBook! Rinse and drain chickpeas in a colander. Spread onto several towels to dry, rubbing gently with the towel to help dry and to remove some of the outer skins (don’t worry if they don’t all come off). Once chickpeas are totally dry, transfer to rimmed baking sheet and place into a cold oven. Turn heat to 400°F while the chickpeas are inside; this helps them dry out more before baking. When oven temperature reaches 400°F, set timer for 13–15 minutes. After 15 minutes, remove sheet from oven and drizzle chickpeas with olive oil and maple syrup; sprinkle with salt. Roll peas around with a rubber spatula so all surfaces are coated. Sprinkle with cinnamon and roll peas again until thoroughly coated. Return to oven and bake for 15 minutes more. Turn off oven and leave door cracked for 30 minutes. Remove baking sheet and let cool completely on a wire rack. Store in a sealed container at room temperature.